The title’s a bit misleading; the story’s really about a colourful prayer rug, but I guess that would’ve been a strange title for a horror novella. The ancient rug’s a heirloom, handed down through generations and now inherited by the main character, Daniel Ivanov, after his father dies mysteriously – while trying to burn the rug. Not long after, Daniel is shocked to see faces of his family and friends appearing, one by one, amongst the rug’s geometric patterns. And one by one they die. Delving into the history of the rug, Daniel finds out about an event that took place in the titular black church back in eastern Europe, an event that continues to have repercussions centuries later. The Black Church is a story of the venerable cursed artifact school; the obviously haunted prayer rug would’ve been right at home in Friday the 13th: The Series. Tate writes the story efficiently, it’s straight to the point throughout, with a rapid pace that’s accentuated by the short chapters. As a downside we never gain much information about the characters; some pop up only to be wiped out by the rug’s infernal curse. 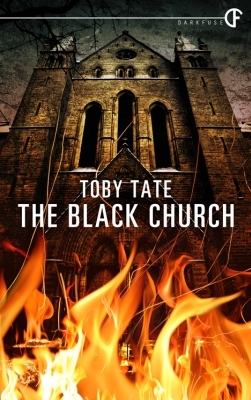 All things considered, it’s a fast, fun read; a present-day supernatural story with strong historical/European roots and a little bit of cheese for good measure (our old friend Adramelech, also featured in The Devils of D-Day, makes an appearance), The Black Church is a worthy addition to DarkFuse‘s continually great series. A special shout-out must also go to the cover designer(s) of the series, surely these are some of the best-looking ebook covers at the moment. Published as an ebook novella in 2013 by DarkFuse. Visit the author’s site!